Mr. Ehud Olmert made history this week as the first former Prime Minister of Israel to face criminal charges. This came after a series of corruption allegations, probes and police investigations since as early as 2006. 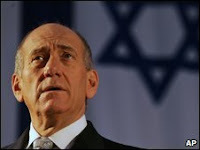 The ongoing corruption scandals had forced Olmert to resign earlier this year. Olmert however, has staunchly asserted his innocence despite growing evidence surfacing of impropriety while he was in office. (iii) the 'Investment Center' where he is accused of acting in conflict of interest by arranging investment opportunities for a friend, Uri Messner, while he was industry minister. Once again, I find the timing of this incident somewhat coincidental since in my last blog entry, when dealing with corruption in the construction industry in Trinidad and Tobago, I sought to draw a positive though cursory comparison between Israel's plan for economic development and the Vision 2020 Plan of Trinidad and Tobago. Israel, a developing country as well, has been said to be "the only democracy in the Middle East" enjoying a special relationship with the United States, some considerable economic success, and engaging in sporadic requests for EU membership. However, I would certainly not be the first one to suggest that numerous factors make this self styled democracy somewhat strained. Israel has had very fervent critics from inception, who have asserted that Israel's formal democratic status is a sham given that Israel is constitutionally termed a "Jewish Democratic State" with no separation of synagogue and state despite the fact that approximately 20% of its citizens are not Jewish. Even more controversial is that several laws are explicitly discriminatory. These can be traced back to Israel's foundation in 1948 which, driven primarily by the racist genocide suffered by Jews in Europe during the Second World War, was based on the notion of a Jewish state for Jewish people. Some of Israel's laws reflect this principle and as a result discriminate against non-Jews, particularly Palestinians who had lived on the lands for generations. The Law of Return for instance provides automatic Israeli citizenship for Jewish immigrants, whereas Palestinian refugees who were born and raised in what is now Israel are denied even the right to return home. Other statutes explicitly grant preferential treatment to Jewish citizens in areas such as education, public housing, health, and employment. Leaders in post colonial democratic states like those in the English Speaking Caribbean may readily turn up their noses at this style of democracy where there is no separation of church and state and overt state sanctioned discriminatory action against citizens. Certainly here in the Caribbean, we may very well feel that if we were all to sit the Democracy test our States would achieve higher grades than Israel. But, is this really true? Of interest, no doubt spurred on by the controversy surrounding its democratic status, Israel has established its own Israel Democracy Institute. Established in 1991, the Israel Democracy Institute (IDI) is an independent, nonpartisan, nonprofit think tank located on the seam between academia and government. Comprising a select cadre of Israel's leading thinkers, the Institute is the premier nongovernmental agent of change in the Israeli body politic and has been driving the process of Israel's transition from formal to substantive democracy. In 2009 IDI produced a Democratic Index which ranks and compares Israel with several established democracies using several institutional, rights based and stability indicators. The Democratic Index reveals that despite some demonstrable improvement in some indicators, Israel still received low scores when compared with the developed democratic countries that participated in the study. The general trend change compared to the 2008 Index was mixed. Out of the 18 indicators updated this year, while seven registered improvement, six registered deterioration, and five showed no change. When comparing internationally, Israel’s ranking went up in three indicators, remained unchanged in ten indicators, and declined in four indicators. It may be that the relative scores on the IDI Democratic Index that the very serious corruption allegations which forced Olmert to resign are negative indicators from the point of view of democratic governance and corruption levels. I take a different view and will develop that a little more below. Juxtaposing Trinidad and Tobago and Israel for the purposes of useful comparison may not be as far-fetched as some may think on its face. The Heritage Foundation in Washington and the Wall Street Journal have developed Economic Freedom Index which they define as "the fundamental right of every human to control his or her own labor and property. In an economically free society, individuals are free to work, produce, consume, and invest in any way they please, with that freedom both protected by the state and unconstrained by the state. In economically free societies, governments allow labor, capital and goods to move freely, and refrain from coercion or constraint of liberty beyond the extent necessary to protect and maintain liberty itself". In developing the Index ten indicators were measured and the methodology is transparent, available for download here. Despite significantly outscoring Trinidad and Tobago on several indicators, the end result was that Trinidad and Tobago received the score of 68.0 and Israel received an overall score of 67.6 with the countries ending up back to back on the list of 179 countries, 41st and 42nd respectively! I was struck by this, having whimsically embarked upon this blog item on Olmert's corruption charges, not expecting in my comparison of Israel and Trinidad and Tobago that I would find so many similarities. What this index reveals, however, is that behind more or less similar average overall scores, we are actually dealing with two totally different small developing countries. One is small and seen as "the enemy of its region" surrounded by nations with which it has an almost war-like relationship, the other a small, oil state surrounded by semi-dependent, touristic tropical islands. That Israel scores poorly on government size is the direct consequence of it being in a state of war, something which translates immediately into a far above average government size. The rating is constructed in such a way that large government size is in normal circumstances positively correlated with an increased probability of corruption and reduced freedom. The other way around, the situation of Trinidad and Tobago with its oil wealth translated into a relatively free/capitalist structure with a small government - a situation normally assumed to lead to a reduced probability of corruption - reveals something quite remarkable: it is actually in the corruption indicator that the island state is posting its worst grade by far! In other words, careful analysis of the component indicators unravels what was hidden when looking solely at the overall ranking. Although scoring similarly overall with Trinidad and Tobago slightly ahead, taking this on face value would be dangerous given the drastically different and remarkable scores on corruption levels. Israel with its large government (usually thought to result in higher corruption scores) is in actuality far less corrupt than Trinidad and Tobago with it's small government size. (i)which allows a state prosecuting office to operate independently and without interference in the investigation of a Prime Minister in office, (ii) has a strong media to aggressively expose alleged corrupt activity, (iii) which facilitates the voluntary resignation of a Prime Minister and (iv) which produces an institute like the Israel Democracy Institute is doing far better in terms of democratic governance and curbing corrupt activity, than let us say for arguments purposes Trinidad and Tobago. 1. Widespread allegations of corruption in the public construction sector - Commission of Enquiry appointed. Although the work is not complete, already damaging evidence adduced including the startling evidence of the Chairman of a State Company Board inviting a company to tender which shared his fax number and on which his wife's brother and brother in law were the directors. Awarding the contract to this company which was not the lowest or the second lowest tenderer. 2. Government officials steadfastly refusing to step down from office despite calls from throughout the country for them to do so. 3. Court ruling that the Integrity Commission established to protect integrity in public life acted unconstitutionally, unlawfully and maliciously in pursuing an investigation which was rumoured to be politically motivated. 5. Firing of a Government Minister for speaking out and calling for greater oversight over a state agency. 6. Allegations of the interference of the politically appointed Attorney General in public enquiries and prosecutions. 7. Threatened media - with a situation occurring where the Prime Minister caused two broadcasters to be suspended for criticising him on air. These and many other incidents in Trinidad and Tobago may have contributed to the poor corruption score on the Transparency International Corruption Perception Index and the Index of Economic Freedom. For me, I did not have to analyse the corruption indices and the Index of Economic Freedom to know that Israel was doing better than Trinidad and Tobago on the issue of confronting and enforcing the law against corrupt offenders. Whilst some may view the Olmert scandal as an indicator of high corrupt levels, I say it is arguably one of the strongest indicators of a robust democracy serious about addressing the issue of corruption.